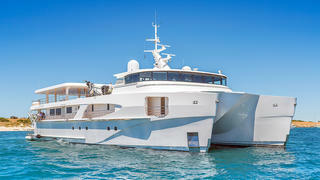 The 51 metre superyacht support vessel Charley has been delivered to her owner by Australian yard Echo Yachts. The twin-hulled shadow boat will serve White Rabbit Golf, the 84 metre trimaran superyacht that is currently under construction at Echo Yachts’ Henderson facility and due to launch before the end of the year. Despite being a superyacht support vessel, Charley still features plentiful options for entertaining guests en-route to the mothership. These include a sheltered observation deck, an informal dining area with seating for eight around a circular table, and a lounge complete with flatscreen television and on-board piano. 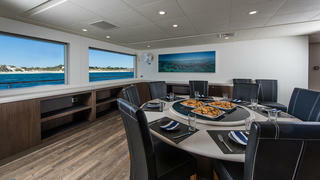 Tender storage is extensive with room for several RIBs aft of the wheelhouse, while a 12 metre custom catamaran tender called Vicky can be carried on the large aft platform. In total, Charley is believed to be able to carry a fleet of up to 10 watercraft, including five tenders, four Jet Skis and a hovercraft, while her upper deck doubles up as a touch-and-go superyacht helipad. 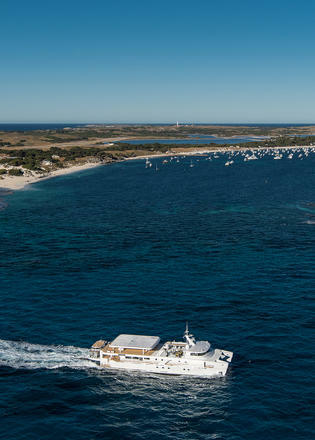 Other key features include a dive store, decompression chamber and sonar system for searching out the best wreck dives. 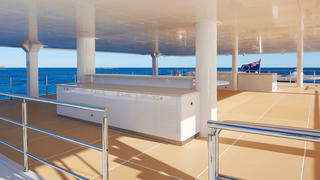 Accommodation is for up to five guests in three cabins, while the crew quarters allows for a staff of 13 people. This tri-deck catamaran features naval architecture by New Zealand-based studio LOMOcean Design, who also contributed the exterior and interior styling. Power comes from a pair of 2,700hp Cummins QSK60 engines, while the total fuel capacity of 60,000 litres means that she has a maximum cruising range of 2,500 nautical miles at 16 knots. Charley was launched in December 2016 and completed her sea trials off Perth prior to delivery. The yard added that she is the largest composite resin infused vessel to be built in Australia to date.